The Solo 401(k) Plan is a retirement plan for self-employed individuals and small business owners. It has many of the attractive features of the employer-sponsored 401(k) Plan, with a few added perks specifically for the self-employed. What is a Solo 401(k) Retirement Plan? The Solo 401(k) is essentially how it sounds: a 401(k) plan for one individual. The IRS rules state that you can make contributions to a Solo 401(k) retirement Plan if you have no employees except for yourself and your spouse. Eligibility: You must be self-employed or a small business owner with zero full-time employees. 2019 Contribution Limit: For 2019, the Solo 401(k) contribution limit increased from 2018. A plan participant under the age of 50 can make a maximum employee deferral contribution of $19,000. If you’re 50 and older, you can make contributions up to $25,000. Total Limit for Couples: Contributions for your spouse can be made separately and the contributions can be equal. This will increase the annual Solo 401(k) contribution limit to $112,000 (under 50) or $124,000 (over 50) in 2019. 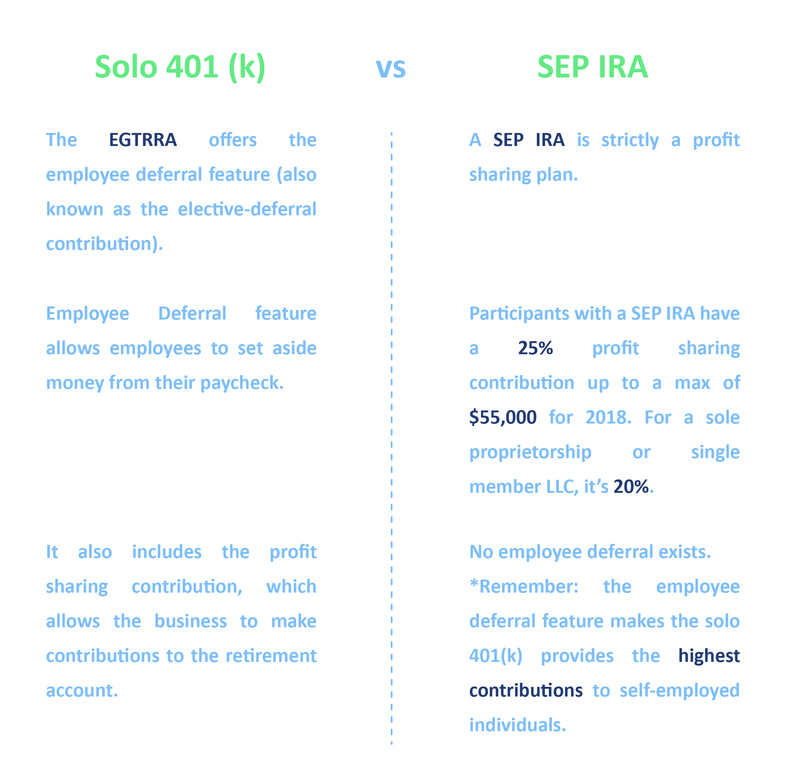 Why Choose a Solo 401(k) Plan Instead of a SEP IRA? The Solo 401(k) is a more attractive retirement plan than an SEP IRA for a few reasons. First, it’s less complex than a SEP IRA and more tax-efficient. The Solo 401(k) Plan offers an employee deferral feature (also known as the elective deferral contribution), which is the bread and butter of the individual 401(k) plan. The employee deferral feature allows employees to set aside money from their paycheck, however, there is also the profit sharing contribution. As you may already know, this allows the business to make contributions to the retirement account. Compare to the SEP IRA, which only offers the profit sharing contribution. The Solo 401(k) retirement plan ultimately allows you to reach your maximum contribution faster than the SEP IRA. Why Establish a Solo 401(k) with IRA Financial Group? You have many IRA custodians to choose when establishing your Solo 401(k) retirement plan. However, IRA Financial Group’s Solo 401(k) providers are the best in the business. Our team delivers excellent service and competitive Solo 401(k) Plan prices. Establish your Solo 401(k) with IRA Financial Group and experience the difference. Our in-house retirement tax professionals have worked at some of the largest law firms in the United States, including White & Case LLP and Dewey & LeBoeuf LLP. Their tax and ERISA experience is unmatched in the industry and it’s why IRA Financial Group is seen as the leading facilitator of true “checkbook control” Solo 401(k) Plan structures. You will work directly with our in-house retirement tax professionals to set-up an IRS compliant Solo 401(k) Plan. Our clients have direct access to our in-house retirement tax professionals to ensure that the IRA Financial Group Solo 401(k) satisfies the client’s retirement and investment objectives. In fact, we encourage our clients to contact our in-house retirement tax professionals with any tax and ERISA questions concerning the structure or a proposed investment to ensure full IRS compliance. The IRA Financial Group Solo 401(k) experts will take care of the entire set-up of your IRS compliant Solo 401(k) Plan. Our Solo 401(k) Plan experts and tax and ERISA professionals are on site greatly reducing the set-up time and cost. You will find that our fee for this service is significantly less than other companies that perform the same or similar services. IRA Financial Group is the market’s leading provider of Solo 401(k) Plans. We have helped thousands of clients take back control over their retirement funds while gaining the ability to invest in almost any type of investments with their Solo 401(k). We strive to offer our clients Solo 401(k) Plans at a fair and reasonable price. Whereas our competitors must outsource most or all of their tax work and consultation, each client of the IRA Financial Group is assigned to one of our in-house retirement tax professionals. This allows us to offer customized Solo 401(k) Plans for significantly less than our competitors. At IRA Financial Group, we stand the by integrity of our Solo 401(k) Plans. We follows the rules of ethical conduct in all that we do. Our relationships with clients are built on trust, respect, and confidentiality. We anticipate the changing tax and financial needs of our clients and creatively adapt the IRA Financial Group Solo 401(k) tax solutions to address them. We ensure our clients’ satisfaction and strive to meet and exceed our clients’ expectations. IRA Financial Group will take care of everything. We can handle the whole process your way. By phone, email, fax, or mail. Do you still have questions on what a Solo 401(k) Plan is and how to establish an IRA Financial Group Solo 401(k)? Contact us directly at 800-472-0646. Or fill out the form to speak with a 401(k) specialist.